This lyre was found in the ‘Great Death-Pit’, one of the graves in the Royal Cemetery at Ur, Sumeria [South-Iraq]. Three lyres were piled on top of each other. They were all made from wood which had decayed by the time they were excavated. Two of them (of which this is one), were entirely covered in sheet silver attached by small silver nails. This made reconstruction possible after digging them up very carefully . [Brit. Mus. data]. From the tomb of Any, Thebes, Egypt. New Kingdom [1550 – 1069 BC].The sound box has the head of a deity wearing a double crown and striped head-dress at its end. 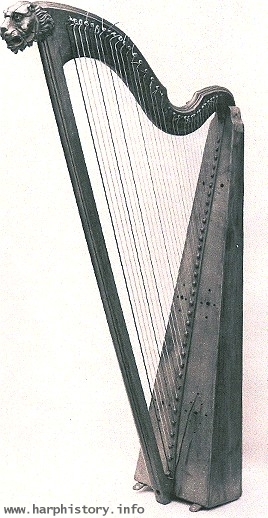 This type of harp usually had 9 – 11 strings. It was used for accompanying songs and was played most of the time playedby male solo artists. Rounded soundbox in the shape of a spoon or spade.Thebes.., Egypt. New Kingdom [1550 – 1069]. On the back of the neck are five holes for wooden pegs. Probably five strings. Soundbox covered originally with goat’s skin. It was the ‘classical’ form for an arched harp throughout Africa for ages. Also called Shoulderharp for it could be played while walking with the harp on one shoulder. From a tomb in Thebes, Egypt. New Kingdom [1550 – 1069]. The string rod has four notches to secure the four strings. The neck has four pegs. The soundbox is covered with skin which has two rows of holes probably for acoustic reasons. This instrument has an upright soundbox and a horizontal suspension rod. It was found in a tomb in Egypt, Thebes. New Kingdom [1550 – 1069]. Its green leather covering is original. It was found in very good shape. It has 21 strings of which the lowest string is four times as long as the highest. This would have achieved an even sound all over. The soundbox is 110 cm in height. So it is a big instrument to hold. Its origin is thought to be Assyrian. This lyre was found in a tomb at Deir el Medineh, Egypt. New Kingdom [1550 – 1069].This form was used for easier playing while walking. Its origin is foreign since it is played by non-Egyptian musicians as can be seen on several pictures [see background information] . It has eight strings fastened at the crossbar with tuning bands [now gone]. The strings are secured under the soundbox after passing it outside. Not inside like a harp. 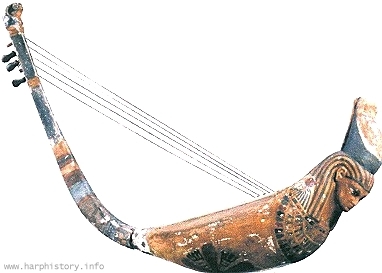 This lyre was found in a tomb in Thebes, Egypt. New Kingdom [1550 –1069]. A nice decoration of equine heads on both sides gives it a special flavour. The meaning of this decoration has not been discovered. It had 8 – 11 strings that are fastened on a little box outside the soundbox. It looks like a strong instrument made for daily use. The Burmese name of this instrument is saung-gauk. It is unknown when it came to Burma but early pictures date from the 1st cent. BC. It has 13 strings which can be tuned with the tuning cords. 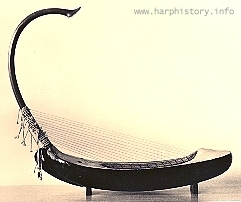 The picture shows a modern harp but before 100 BC it was already present in the Far East. In the Altai mountains in Russian West-Siberia archeologists found the remnants of this angular harp while digging up a royal tomb. It was a big surprise to find this instrument which seemed to come from Near-East Mesopotamia. Careful reconstruction revealed an instrument with a large soundbox covered with skin and it had 5 strings. It is thought to be from the 5th cent. BC. 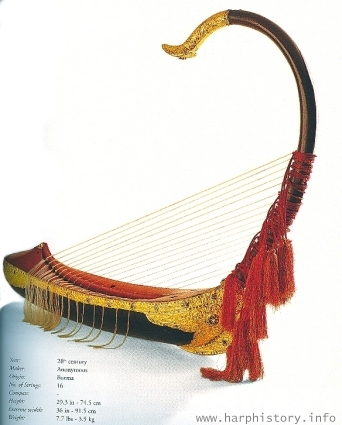 In Thailand [former Siam] the arched harp has about the same structure as the Burmese harp. It is called Pin-nam-tao and has 15 strings. The arch is made of the root of a special tree. Just like the Burmese arch. Harpmakers have to search for it in the woods. 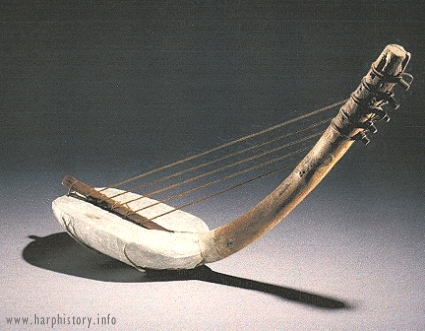 The picture shows a modern harp but the tradition dates from about 100 BC. In Japan it is called kugo and it is a modern reconstruction from old pictures. It has 23 strings. In stead of mere reconstructions new modern kugo’s are built but following the same building scheme as the traditional ones. The lyre was an instrument used much more than the harp. Everywhere in the world people played some kind of lyre as nowadays the guitar. 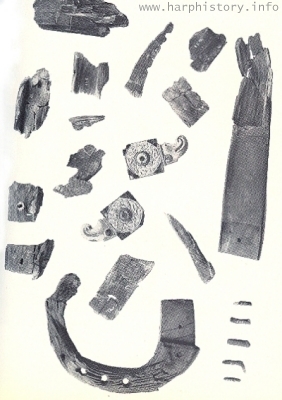 These remnants were found in a ship burial site in Sutton Hoo, East Anglia, England. Dating from the 7th cent. 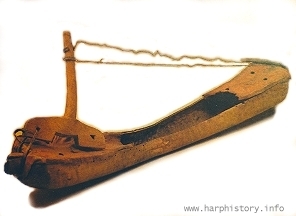 AD it was first thought to be a harp, and the earliest example of a European harp to boot. But careful reconstruction showed it had to be a lyre. 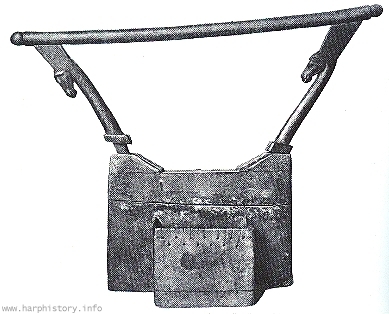 A German lyre since the grave was that of an Anglo-Saxon nobleman. And this is what it could look like. 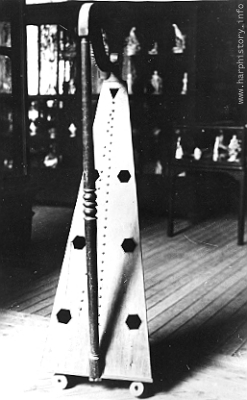 A Northern European instrument which later developed into the Crwth or Bowed Lyre. A remarkable instrument of which nearly nothing is known. The Ostyak live in Northern Russia near the Finnish border. It is a harp called kiotang and the drawing of one of those is all there is. In Geneva [Sw.] there is one such harp in a museum. It is called mediterrane but it is more like the old boat-shaped harps from the Near East. It is a puzzle. 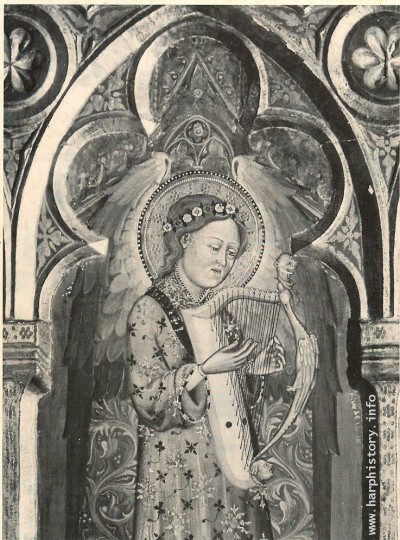 The ivory parts of this harp were made in Burgundy in the 14th century. The soundbox is a new reconstruction. This model is called Roman or Early Gothic. No relation with the periods in architecture. Musicologist Curt Sachs first called the two different models so. Just for easy recognition. 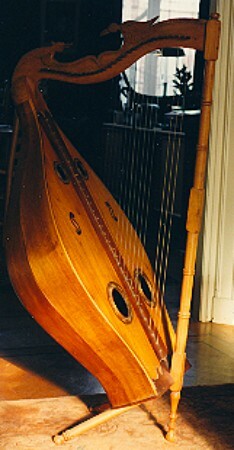 This type of harp was popular during the late Middle Ages. 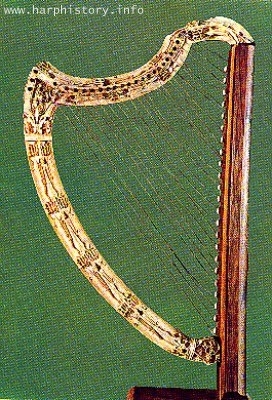 This is perhaps the most represented type of harp in European art of the Middle Ages and Renaissance. 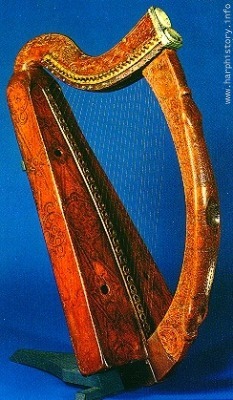 It is a small elegant harp with the characteristic ‘beaked’ neck known in all these instruments. It has 26 strings. Along the stringline on the soundboard it has small ‘buzzers’ for special effects. It was fashionable for a certain time but disappeared later on. This is the famous clarsach of king Brian Boru, or so the legend goes. It dates from the 15th century. The king lived during the 12th century. It is one of the oldest Irish/Scottish instruments. The soundbox is made from one piece of wood, hollowed and open at the back. It has about 28 metal strings. Except for all the beautiful stories about this harp there are no real, historically true data. It is kept in Trinity College, Dublin, Ireland. This harp is better known as the Queen Mary clarsach. Mary, Queen of Scotland lived during the 16th century. The harp was built in that same time or somewhat earlier. Famous stories galore about this clarsach. The only historical truth concerns about its whereabouts. It was kept for ages [16th through 19th cent.] in safety by the Lude family in Perthshire. After that is was donated to the Museum of Antiquities in Edinburgh. Clarsach lumanach / Lamont harp is its name. Rather different from the royal harps of queens and kings. It is a ‘normal’ instrument, showing the wear and tear of being played in the old days. It was built around 1460 for the Lamont family in Argyll. 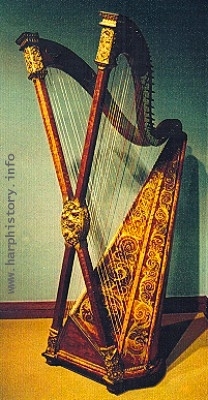 When daughter Lamont got married to the son of Lude, this harp also found refuge in the Lude house. It is now in the National Museum of Scotland [former Museum of Antiquities]. 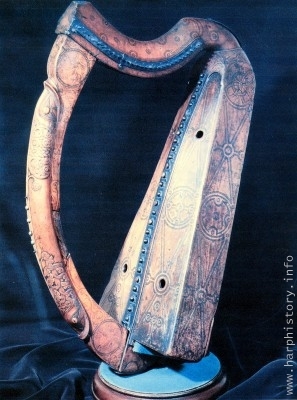 The harp of the famous Irish harper/composer Turlough O Carolan [1670 – 1738] should also be famous but not very much is known about it. It was given to him by Lady MacDermott Roe after he had finished his studies, together with a man-servant and two nice horses tot start as an itinerant musician as was usual in those days. The harp is still there in MacDermott house where Carolan said farewell to life. In Spain as elsewhere in Renaissance Europe, the diatonic harp didn’t answer anymore to the needs of the composers. The music of those days needed more semitones than were available on the traditional harp. In Spain the problem was solved by putting another row of strings on the harp. One row for the diatonic range and one for the chromatic semitones. 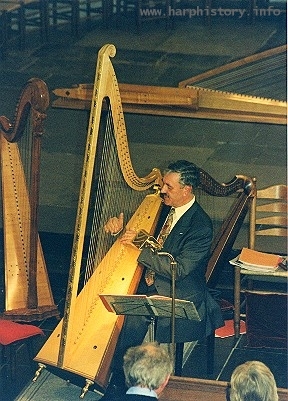 This arpa is a picture and not a real harp and so should not be in this series of real harps. There doesn’t seem to be any arpa doble in existence anymore but it was an important medieval instrument. In Part 2 [harphistory in pictures] more details about it. 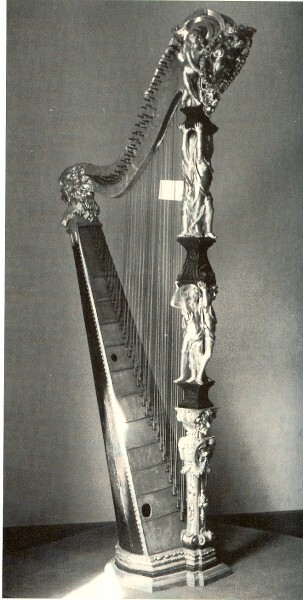 The photo of this harp was taken by Nicanor Zabaleta in 1930. It was built by Juan Lopez in the 17th century. This type of harp played a very important role in Spain and Portugal during the end of the 16th cent until to the 18th cent. Especially in church music where the harpist often was also the organplayer. This harp but then with one row of strings is still being played in Latin America where it was introduced in the 16th century by Spanish priests and teachers. In Italy the music practice needed a chromatic harp. From the end of the 16th century harps with three rows of strings were built in Naples [in those times in Spanish possession]. This harp was ordered by the duke of Mantua for his harpist Laura Pepperaria, a famous performer at his court. 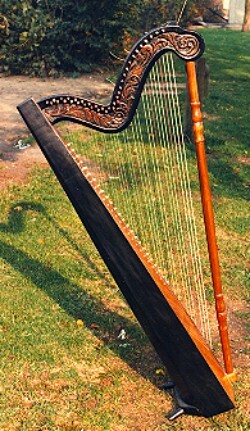 The harp is called doppia although it has three rows of strings. The outside rows are diatonic and the middle row has chromaticsemitones. An other name is Arpa a tre registri or tre ordine [with three rows], but doppia is mostly used. This harp has 3 rows of strings, all fastened at the left side of the neck [or harmonic curve]. The name arpa doppia suggests 2 rows of strings. Well, it has 2 rows of 29 diatonically tuned strings. There is, however, one row in the middle with 19 chromatic semi-tones. Its height is about 190 cm. There is still not much known about the instrument. It is kept in the Museo Civico Medievale in Bologna. This too is an arpa doppia. This 17th century harp looks a bit overdone but it has a beautiful sound board. It has 3 rows of strings but not over the whole length. The left hand diatonic row starts half way up and the right hand does the same starting half way down. Only in de middle it has really 3 rows. It is kept in the Palazzo Barberini in Rome. Richard Hadaway is a maker of copies of old instruments. The authentic harps cannot be used anymore due to their ‘old age’ but for the music from Monteverdi’s time a pedal harp doesn’t sound right.The copies must be nearer the old sound, or so one wishes. And surely these harps sound more mellow and lute-like. 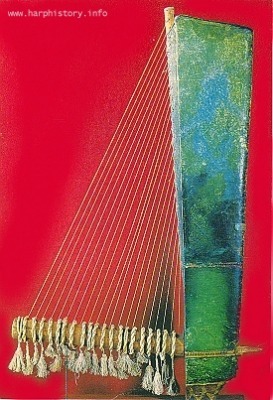 This is a Spanish harp with two rows of strings. The diatonic row and the chromatic row are crossing in the middle. This harp is built by Pere Elias in 1704. It is kept in the Museo Provencial in Avila. This type of harp was frequently used in Spanish church-music in the XVIth through the XVIIIth centuries. Often the harpist was also the organist using the harp for the softer parts of the church-music. Johann Volckmann Rabe was a German harpmaker. He made harps with one row of strings, with hooks for the semitones and harps with two rows of strings. This harp has 58 strings in two rows, like the Spanish harp. The name ‘David’s harp’ was used because people thought that the Biblical King David played on a harp like this one [which he didn’t. He played the Kinnor, a lyre]. The little sculpture on the pilar sugests a portrait of King David. This harp was built in 1740. It is kept in the Music History Museum in Copenhagen, Denmark. This instrument was built by John Richards, Llanrwst in Wales. A very characteristic part of the Welsh harp is the connexion between the neck and the soundboard. It looks rather frail but it gives room to the working tension between the strings  and the wood. This harp is made of wood without metal stengthening. The sound is rich. 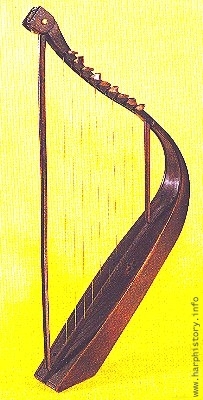 While in Italy this type of harp did not exist very long, the Welsh harp is still used, from the 17th throught to the 21st centuries. 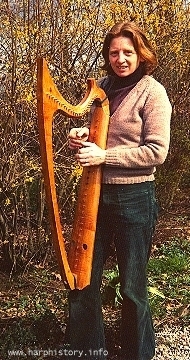 Simon Capp from Wales made this harp for Edward Witsenburg. It is a true copy of the old ones. Perhaps Edward is the only one in the Netherlands who has mastered the difficult art of playing three rows of strings, and it sounds wonderful. 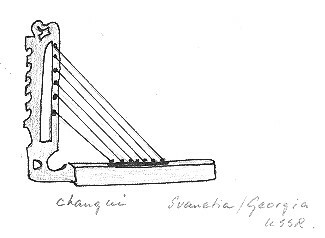 Henry Greenway in Brooklyn, New York USA thought the chromatic harp with two rows of crossing strings a good idea but he considered the tension too heavy on one column. He therefore made a harp with two crossing columns. It was better for the tension but it didn’t make the playing easier. This harp is from 1895. It is now in the Metropolitan Museum of Art in New York, USA. The hook harp, or hooked harp as it is sometimes called, has no pedals for the semitones like all modern harps have. The strings are in a diatonic row. In the 17th century the music then composed needed more tones on the harp than was possible with one row of strings. In Austria the problem was solved by putting little hooks on the neck. By turning these hooks against the string, it sounded a semitone higher. So the first hooks were placed near the F- and the C-strings. This harp is called a David’s harp like the one of no. 30. 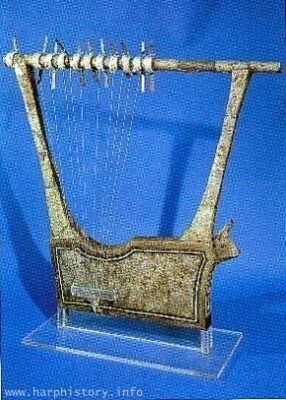 People thought that King David played on a harp like this one. His portrait is on top of the column. This harp has the shape of the Bohemian or Tyrolean folkharp. It was made in de 19th century by Martin Eggert, beuatifully done with rosettes on the soundboard. It has hooks for the F- and C-strings. The Austrian harps of today still have this model, but now they have pedals for all the tones of the scale. This instrument looks like a modern harp,but it was built in 1750. The maker was Le Jeune in Paris, France. He used the pedal-system Hochbrucker in Austria had invented to make playing easier . The hooks could now be moved by pedal-action. On this harp the pedals have one action [the modern harps have two actions; from Ces to C to Cis, etc. 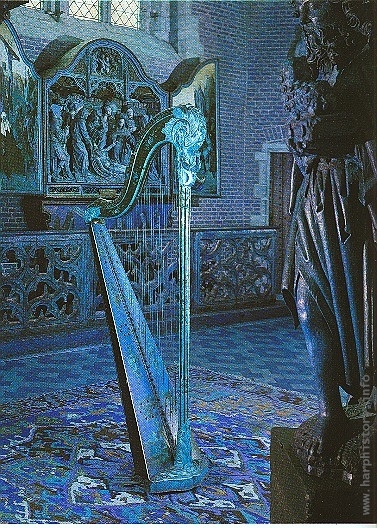 ]This harp is kept in the museum Vleeshuis in Antwerp, Belgium. This richly ornamented but very simple harp is thought to have been built by Stradivarius, the famous violinmaker. Probably he made one such harp, but more than one lookalike is called a Stradivari-harp. It could have been the rage of a certain period of time. There is nothing special about the instrument, musically speaking. This instrument is in a Museum in Lisbon, Portugal. It is from the 18th century and it looks like a Tyrolean folkharp. A nice simple instrument with fine rosettes on the soundboard. That is all that is known about it. Diatonic harp from North Italy. Dated at about the 18th century. Maker unknown. It is now in the Metropolitan Museum of Art in New York, USA. Together with violin, flute and drums this harp makes a nice ensemble. In the streets this harp is carried and played upside down. 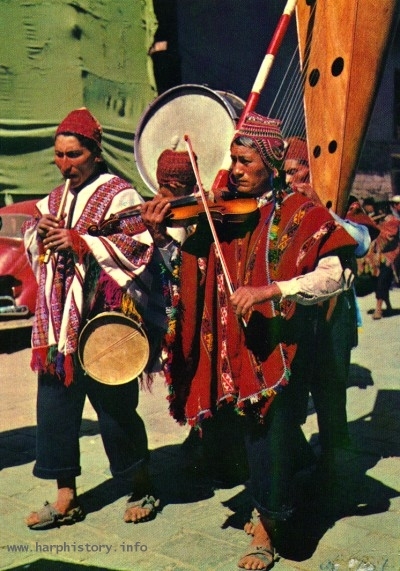 It is a folkharp from the Andes. 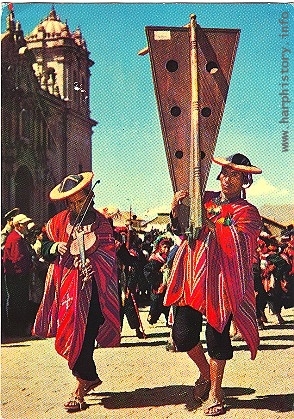 The procession is in Cuzco, Peru. Peruvian diatonic harp, of Spanish ancestry. The harp was brought to Latin America after Columbus had ‘discovered’ America. After him came the teachers to bring church-music and teach the ‘Indians’ to play and sing the Spanish music. From then on the harp, till then unknown in these countries, had a tremendous success and still has. Playing upside down was safer for the instrument during processions in the streets. A different type of harp from Peru, called the ‘cut pear’ with beautiful woodwork along the neck. This is a new instrument, more or less a copy of older ones. 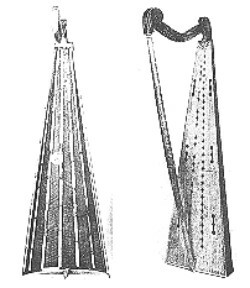 Diatonic harp from Paraguay. This is a new instrument. It was owned by the late Dutch harpmaker Hans den Brok who could play the music from this country. 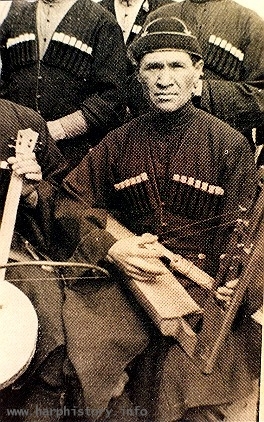 In Georgia, south of Russia, people played the changui. 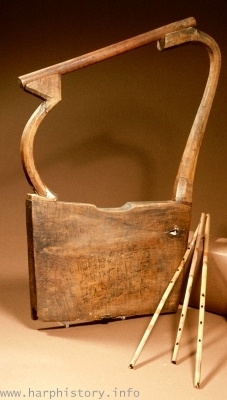 This type of hook harp has a long history, having been played for more than 2000 years in Asia and still present in some places. Folkmusic with string-instruments, woodwind and drums. This looks like the same sort of instrument as in no. . The picture is from the New Grove’s Dictionary. Old traditions must be cherished, so even without more information it seems worthwhile to mention these instruments anyway.